Shiva Carey just might be the youngest sponsored skateboarder. Move over Tony Hawk. Shiva Carey, the latest skateboarding sensation, is 33 years younger than Hawk -- the sport'smost famous forefather. And Shiva might be the youngest ever to become sponsored. 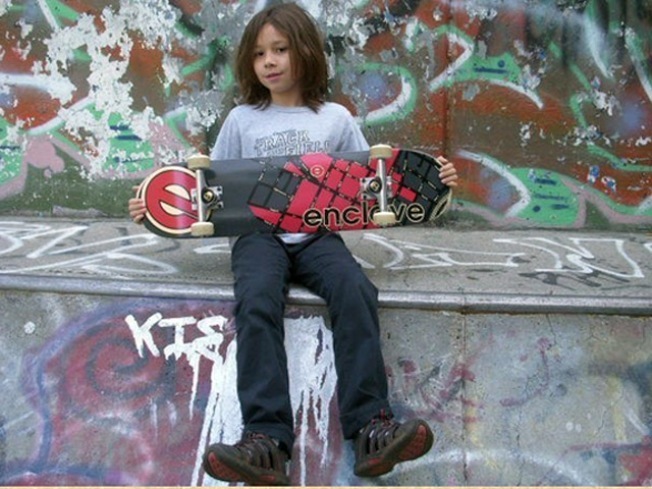 The Enclave Skate Shop is sponsoring Carey, a 9-year-old skateboarding prodigy, providing him new equipment and paying for his competition entry fees, the New Haven Register reports. A proclamation from the City of New Haven says he’s the youngest skateboarder to be sponsored, but there’s some question to that. He’s in the running with Ryan Schekler, who was sponsored “by the time he was 10,” according to the New Haven Independent. Whether he was 9 or 10 when he secured the sponsorship is not clear. Regardless, getting the nod from Enclave is a major accomplishment, and recognition for what Shiva loves to do. Shiva has always enjoyed vert skating with his friends. “When friends get together to skateboard, there is nothing better that I can think of,” he told the Independent. Shiva already seems to be doing that. He has made several YouTube videos, in which he teaches how to do tricks, all while encouraging skaters to wear protective gear. These videos can also be found on Shiva’s official website. Besides skateboarding, Shiva dreams of making movies, his father, Brainard Carey, said by e-mail. “Shiva is writing a script now for a skateboarder super-hero story, about a kid who gets super powers from his skateboard,” Brainard Carey said. Shiva’s acting roots include local productions, such as “The Red Tent” and “The Mysterious Case of The Tarantula’s Bite” at the Neighborhood Music School. He also dreams of seeing it be made into a video game. At 9 years old, Shiva is well underway to pursuing his dream goals. "Anybody can do what they want, life can be like a Disney movie, amazingly, you can get what you dream!” Shiva said by e-mail. “My wish came true, yours can too."